Apple AirPods wireless headphones – thumbs up! I’ve been using the new Apple AirPods headphones for a week now and I’m a fan. I ordered the Apple AirPods online on December 13, the first day of preorders. The delivery date was January 12 but the AirPods arrived at my home early on January 4. The AirPods fit my ears perfectly like the similar wired Apple EarPods. I’ve used the AirPods at the gym and in my home office on conference calls and find them comfortable to wear. Sound and microphone quality is a step above the stock Apple EarPods and is very good. Pairing with all my Apple devices – iPhone, iPad, Mac and Apple Watch was a simple one step process – open the AirPods case and tap on my iPhone screen. However, I ran into problems when trying to connect to different Apple devices, particularly my Apple Watch. After a few days, most of the problems went away except for connecting to the Apple Watch which has been consistently problematic for me on multiple watches (Series 0, Series 2) and multiple headphones (AirPods and Beats Wireless Studio). 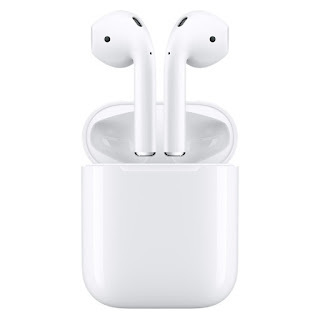 After 2+ months of almost daily use, I continue to be a fan of the Apple AirPods and I consider them the most innovative new product Apple has released in the past several years. The issues I experienced during the first week switching devices have disappeared. While there have been some minor firmware updates, there have been no new features or capabilities. I’m hopeful that a double tap to mute feature is added in the future to make it easier to use AirPods on conference calls. Doesn't they drop out of the ears if you move your head? Not for me. I wear the AirPods to workout at the gym and haven't had a problem. That said, the AirPods don't fit everyone.